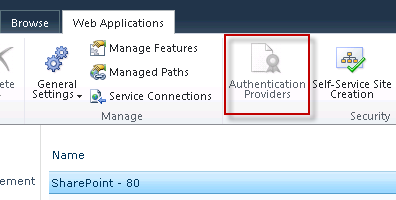 So you want to know if that SharePoint 2010 Web Application is configured with Claims Based or Windows Authentication? The place to do this is via Central Admin -> Application Management -> Manage Web Applications. 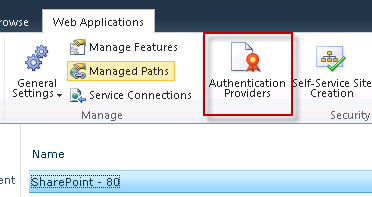 Then click on the Web Application and click on Authentication Providers in the Ribbon under the Security Section. BUT you might find that this icon is disabled like this screen shot. Not to worry as you can enable it using one of two methods. One is to disable UAC via Control Panel but that's not really something you want to do. The other option is to Run your Browser as an Administrator like shown here. 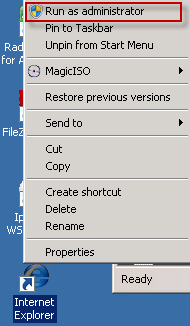 Now you will see that the icon in the ribbon is enabled as shown here. Now simply click the icon and you'll see something like the following 2 screen shots. If you want to CHANGE the authentication type then you will need to do that via Power Shell which I will explain in another post.